So this week I made it to Stol! I usually go at least a couple of times a year but I’d been waiting (and waiting…..) for a day when it didn’t look as if it was going to rain at any time. Stol is notorious for having a little ‘cap’ of cloud on its top, and it can also be get very windy up there, so it’s wise to carefully choose the day for an ascent. However, I gave up waiting and went on Thursday anyway and I’m pleased to say I did make it up and down before the rain appeared though there were literally only seconds to spare as within half a minute of getting back to the car it started raining – phew! Alas, as I was rather rushing, and since it was cloudy at the top, I wasn’t able to take any great photos on this occasion but here are a few from previous trips. At 2236m, Stol is the highest mountain in the Karavanke range and is visible from far and wide (including from my bedroom window!). The mountain is so named due to its shape which resembles a chair – Stol being the Slovene word for ‘chair’. Some people drive the first part of the route and start their walk from the mountain hut Valvasorjev dom (1181m). However, I like to take the route up from the valley floor, starting from the small reservoir in the Završnica valley and walking to Valvasorjev dom then on to the Žirovniška planina. From here there are a choice of two routes up to Stol – the Žirovniška pot or Zabreška pot. 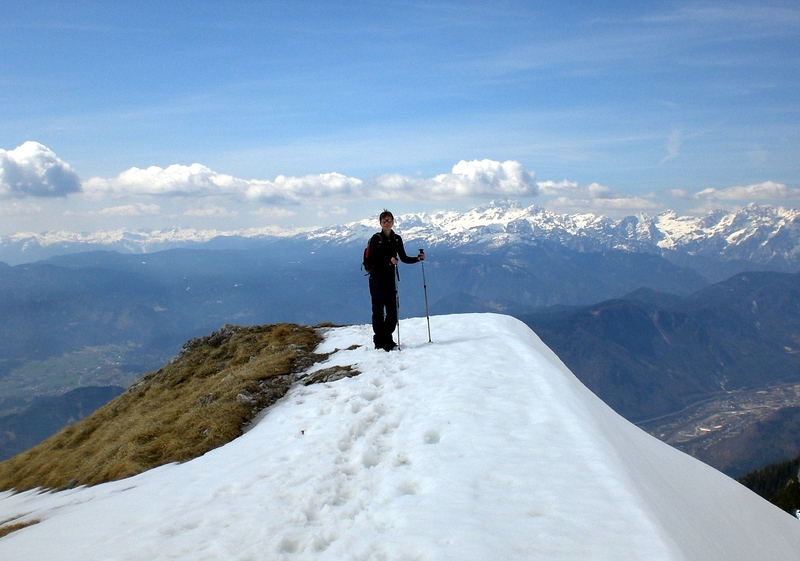 The former is a slightly shorter but steeper and harder ascent and I therefore prefer to take this route up and then return via the Zabreška pot – a slightly longer but easier descent – which also avoids having to take the same route there and back and makes for a partly circular route. Stol can also be climbed from the Austrian side however, as can be seen from this photo below, the northern face is more exposed and rocky than on the southern facing Slovene side. The path is fairly relentless with hardly any level parts. It begins in the cool shade of the forest then in parts traverses open ground until the final section of the ascent which follows a broad rock gulley where it’s not unusual to find patches of snow, even in the height of summer. The Prešernova koca mountain hut is perched in an idyllic location, about 20 minutes beneath the peak of Stol at 2174m, where you can rest and enjoy the stunning views across Slovenia and the Julian Alps. During the summer months it is open daily and offers food and drink plus overnight accommodation for those making longer tours or not wishing to do the entire trip in a day. From the mountain hut a rocky path leads straight up to the summit of Stol where you are rewarded with stunning views across Slovenia, along the Karavanke range and over Austria. Also this past week a friend and I went to see the simply amazing Slovene vocal group Perpetuum Jazzile. It was in fact the third time I have been to see them and they never disappoint. This time they were performing at the open-air theatre at Khislstein Castle and Mansion in Kranj. In contrast to some of their larger concerts, this was a smaller venue but it was perfect as it created an intimate feeling with great accoustics. Perpetuum Jazzile have now achieved world recognition and are touring venues far and wide. The group has a wide repetoire which includes some Slovene classics, modern popular disco and pop and thanks to their new Music Director, who is Swedish, they have also recently begun performing a medley of Abba songs, some of which can be heard here – http://perpetuumjazzile.si/ I’d also recommend checking out their version of Toto’s song Africa (Youtube) – it’s my favourite!